The party is contacted by a harried and tired looking man, by his bearing an adventurers, by his demeanour very worried indeed. He has a proposition for the party but first he outlines his predicament. He is the sole survivor of a party of explorers who, some months ago, set out on an expedition to a distant land of mountains and thick jungles in search of the riches that were reputed to be there. The voyage was hazardous, the jungles deadly and their destination was to prove the most arduous of all – a lost temple deep in the heart of the forest. However, the riches that they managed to loot were reward enough for the trials through which they had come. They returned to civilisation, convinced that the worst was over. Unfortunately, this was not the case. Over the following months, one by one, the party members were hunted down and butchered in the most horrific ways. What was left of them was not enough to suggest that they had even been human. The last survivor knows that his time is drawing near and he has even managed to see glimpses of what he believes is reducing his former comrades to offal. He presents them with a sketch that he has made – a winged serpent of prodigious size. He says that he will hire the party to protect him and slay the monster before it can kill him. So far, so easy – but of course the party’s patron has not got the whole story – far from it. 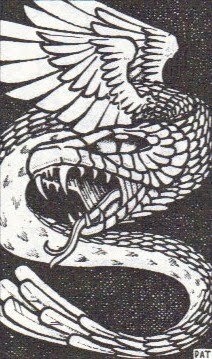 He and his comrades are being hunted, but not by the winged serpent. The entity that was disturbed when his party raided the temple is far worse, something akin to an invisible stalker but with considerably more claws, fangs and spikes. Its exact profile should be up to the DM to stat but it will be more than a match for the average party, with its invisibility the least of its powers. The priests of the ancient civilisation were aware of the entity that haunted the temple and so summoned the couatl to attempt to neutralise the threat. The violation of the temple disrupted the couatl’s ability to contain the entity and, in pursuance of its mission it followed the entity and the explorer party back to their home city. It has not been able to save the other members of the explorer party but now wishes to fulfil its mission and depart. The couatl will probably observe the goings-on using its polymorphing ability to take the form of a child. If it realises what is going on, it will approach the party to advise that only if the treasure looted from the temple is returned there will the entity be dispelled. The last explorer will be reluctant to believe the couatl and give up his treasure; the loot was split between the explorer party members and their shares may well have been either buried with them (as their families believed the treasure to be cursed) or passed on to another family member. The PCs will have to gather it together and transport it back to the temple in the jungle, all the time avoiding the entity. If there is a confrontation between the entity and the couatl, it may be that the latter will be killed or injured so that it is incapable of defending the surviving explorer. If the party work together with the couatl, they may well be able to defeat or at least drive off or incapacitate the entity – either for some considerable time or long enough to make a getaway (depending on how the DM has statted it up). If they manage to kill the entity, the surviving explorer may think that he is no longer in danger and decide to keep the treasure. The couatl will be displeased with this and use its Genius intelligence to work out a way of persuading the explorer to return the treasure. The other members of the explorer party had similar shares. I like this. One of the best ones so far, I reckon. It also illustrates how tricky it was to justify the Couatl's appearance in an adventure. Keep these coming ... waiting for them to all be gathered together!